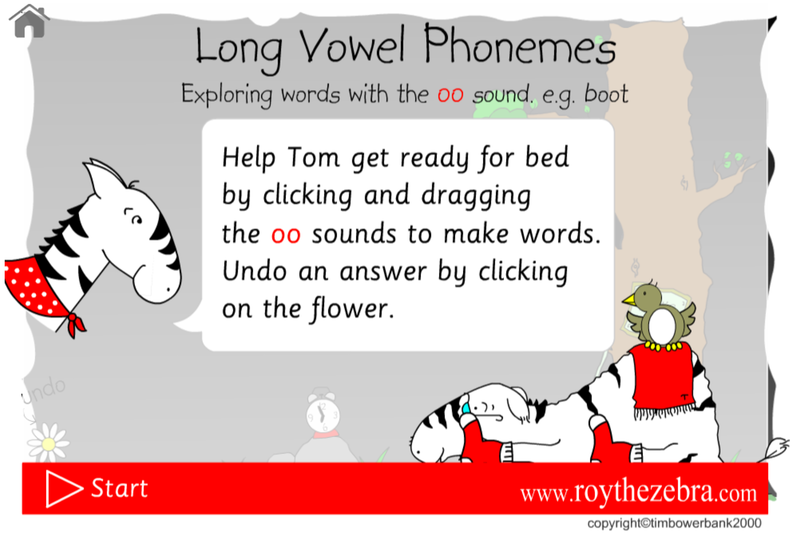 In this long vowel phoneme reading game Uncle Tom is getting ready for bed and exploring long vowel phonemes - he’s really interested in learning the ‘oo’ phoneme and words that use this sound. Help him learn ‘oo’ words and then give him his bedtime bits that will make him have a good nights sleep. Please register if you intend on using this game. We have lots of long vowel phoneme games at Club Roy. Can you help Ol' Uncle Tom explore 'oo' words? These are words with the long vowel phoneme 'oo' in them. Make words with Tom and then give him his bedtime bits so he can have a restful night. 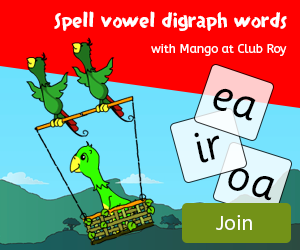 There are lots of long vowel phoneme reading games at Club Roy. Once the reading game is loaded read the instructions and then click 'start'. 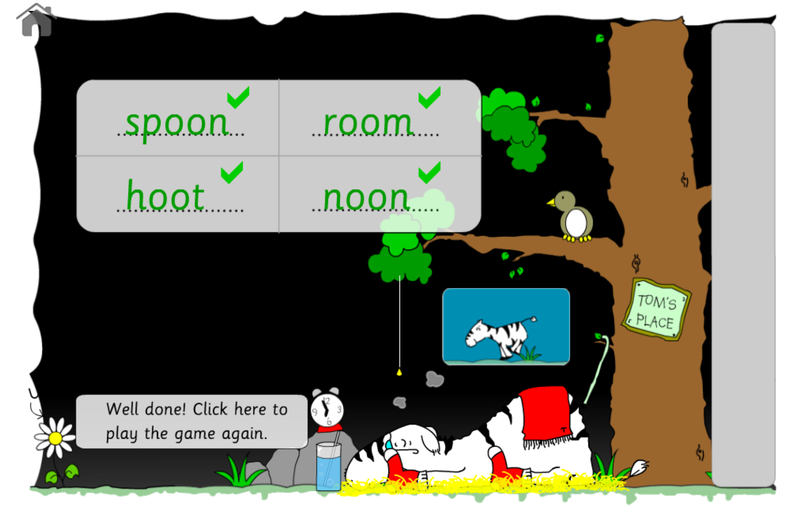 The next screen shows four 'oo' words with their 'oo' long vowel phoneme missing! Find the 'oo' phonemes at the bottom of the game and drag them up to the box to make 'oo' words. For every set of words completed you get a chance to give Ol' Uncle Tom one of his bedtime bits, for example, his bedtime socks. Keep going with the reading game until Tom has all his things and you have made lots of 'oo' words! 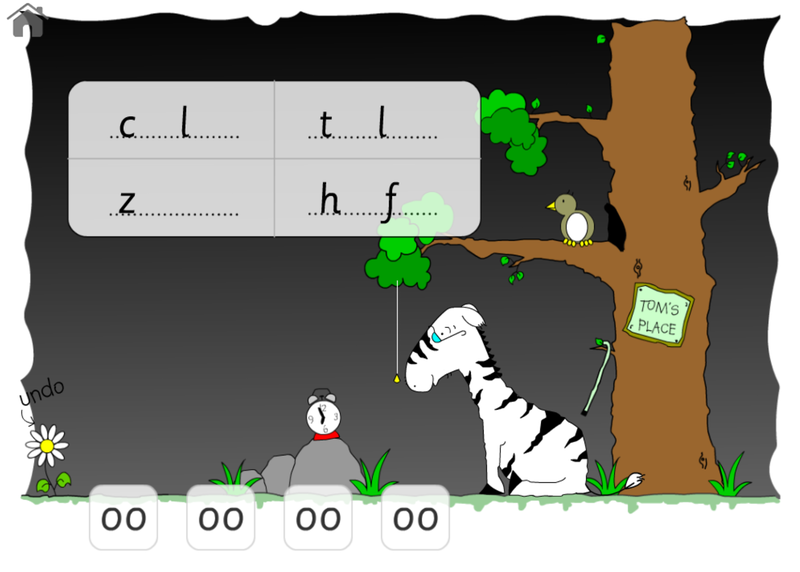 This long vowel phonemes reading game has draggable long vowel 'oo's, animated Tom and bird, animated young tom running through the savanna, easy to use interface. This reading game can be easily played on iPads and Android tablets as well as desktop and laptop PCs and Macs. We advise that you use the latest browser for your system. The game is playable on the following browsers - Internet Explorer, Chrome, Safari and Firefox.